It’s October and I’m a little bit in shock. Mostly because I have so many plans this month that it in my mind it already feels like November is just around the corner. I even have a handful of patients booked in December and before I know it it’ll be 2013 and I’ll be graduating and getting hitched! I love being busy (especially when plans include jetsetting to Europe for a few days), but I must admit things have been almost too hectic these days. I hate when that happens around holidays that I love baking for, because truthfully I wish I had time to post fall/Halloween recipes every day of the week. That being said, these little peanut butter-filled pretzel pumpkins were a great compromise to appease my love for Halloween and the need to fit in my busy schedule. 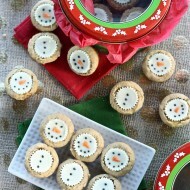 They’re a no-bake recipe that are a cinch to make with a really, really cute result! 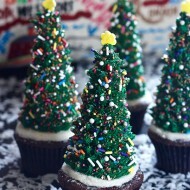 I saw treats similar to this on Pinterest last week and knew right away they’d jump to the top of my “to-bake” list. 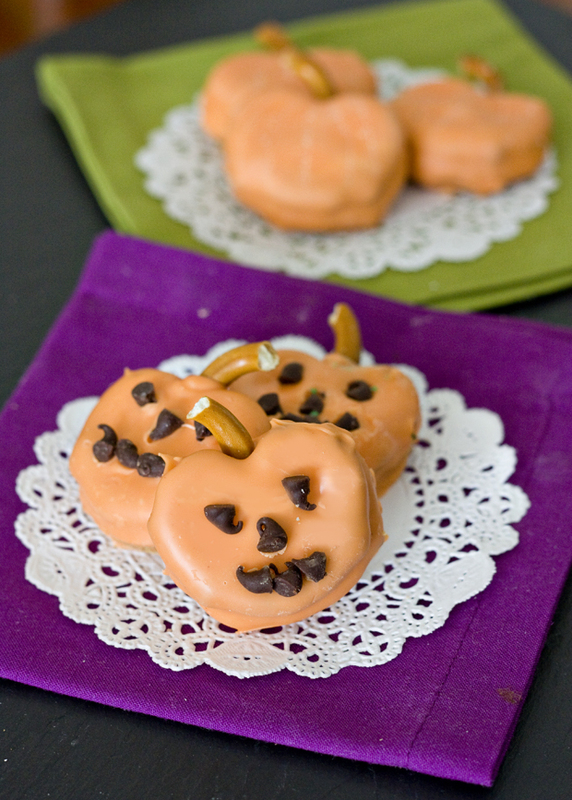 They’re mini pretzel sandwiches filled with a creamy peanut butter mixture and dunked in orange candy melts. 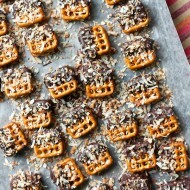 I love the combination of salty peanut butter and pretzels with sweet chocolate, and I even tweaked the flavor here by adding pumpkin pie spice to the peanut butter mixture. 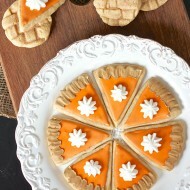 So not only do they look completely autumn-esque, they taste like the season too! 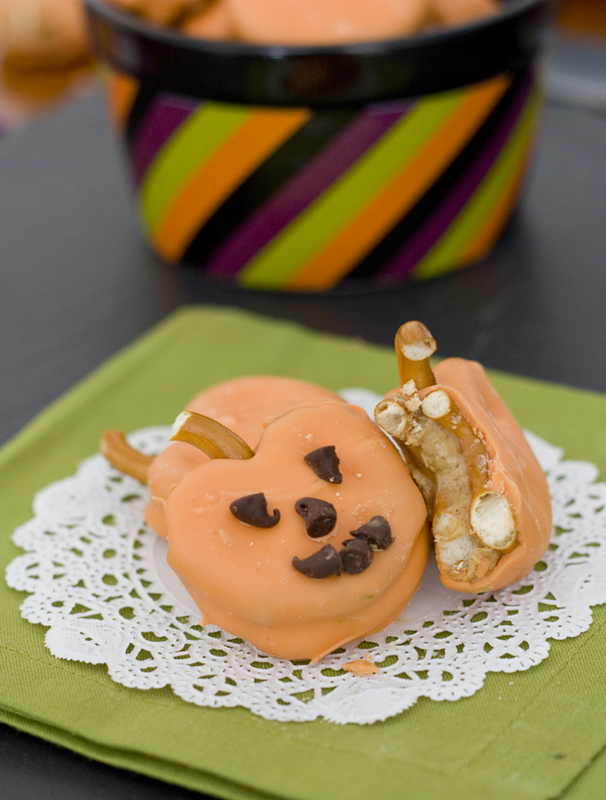 And with a few mini chocolate chips, you’ve got some adorable jack-o-lanterns in no time. Much to the shock of most people I know, I don’t go crazy for pumpkin flavored treats this time of year like everyone else seems to (Pumpkin spice latte for example, not a fan. Please don’t hate me). If you follow enough baking blogs, your Google Reader is probably overloaded with pumpkin recipes now that it’s officially October. But I kind of gag a little bit every time I open a can of Libby’s, so this treat is a great compromise for me – they’re shaped like pumpkins, they have that seasonal spice, but no real pumpkins involved. I must prefer digging into a new jar of Skippy, and these pretzel pumpkins involve plenty of that. In the bowl of an electric mixer beat together the peanut butter and butter until smooth. Add the sugars and pumpkin pie spice and beat until well incorporated. Measure out about a tsp of the peanut butter mixture out and roll it into a ball with your hands. Sandwich the ball in between 2 pretzels and set aside on a wax or parchment paper-lined cookie sheet. 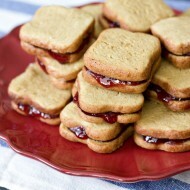 Continue making sandwiches until all of the peanut butter mixture is used. Transfer the cookie sheet to the refrigerator and chill for about an hour. 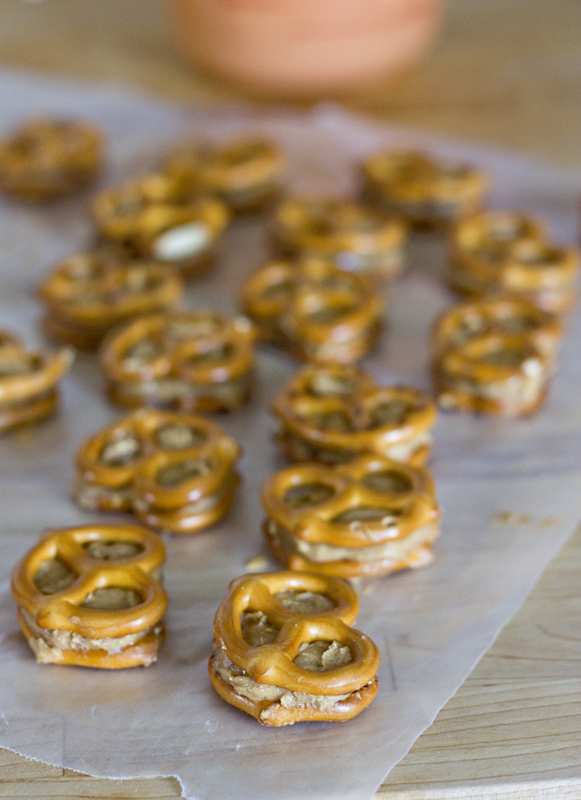 Break pieces of pretzels for stems and set aside. After an hour, transfer the orange candy melts to a microwave safe bowl and microwave on 1/2 power for 30 seconds at a time, mixing well between each interval. Continue until completely melted and smooth. Dunk each sandwich into the chocolate, using a fork to retrieve it. Tap the fork on the edge of the bowl to help remove excess chocolate. Transfer pumpkin to the cookie sheet to set. Add the pretzel stems to the top of the pumpkins and if you're adding jack-o-lantern features, gently press the chocolate chips into the chocolate coating before it has set completely. 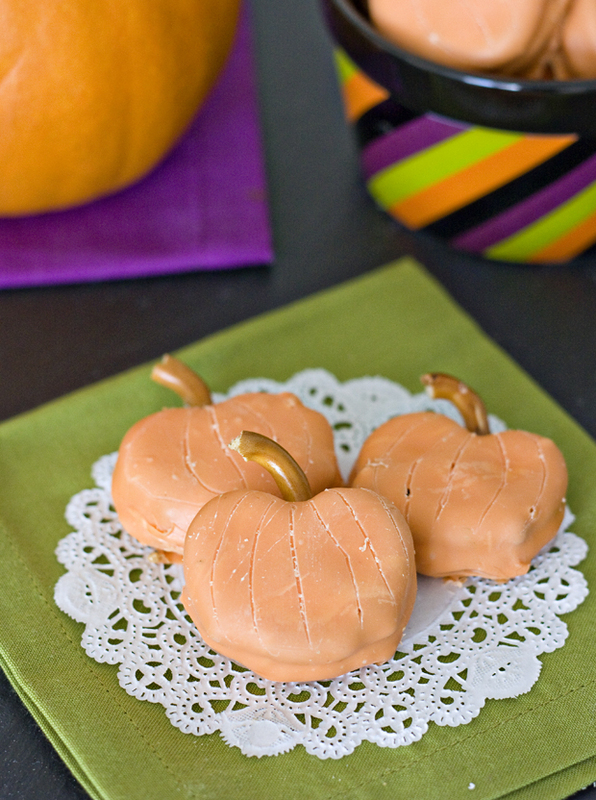 When all the pumpkins are dipped, transfer the cookie sheet to the fridge until ready to serve. 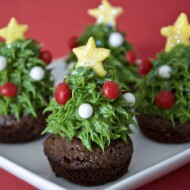 I may have to try these! This is an awesome idea. 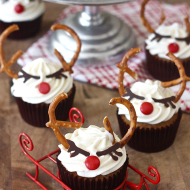 And since they’re pretzels… probably a little bit healthier- maybe? Hopefully? 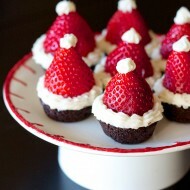 Erica, these are SO cute! I have pinned them immediately! and I love your styling of the shots, awesome pics! Icing ( with wafers ) is too thick to make “pretty” pumpkins! Icing seems to need thinning! Just wanted to add a footnote to my previous comment…I learned to add 1/2 block of paraffin /bag of candy melts. It worked beautifully & I’ve shared your site with a number of people! 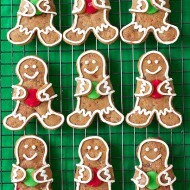 I’ll be making them AGAIN this year & am sure they’ll be a frequently requested goodie gift for years to come. Thanks!